Objective: To observe the effect of percutaneous transforaminal lumbar spine endoscopic discectomy on lumbar disc herniation and its influence on indexes of oxidative stress. Methods: A total of 110 patients with lumbar disc herniation from May 2015 to May 2016 in our hospital were divided into control group (n=50) and study group (n=60) according to different surgical programs, with control group treated with traditional open discectomy and study group treated with percutaneous transforaminal lumbar spine endoscopic discectomy. Operation related indexes were compared between the two groups as well as ODI and VSA scores, serum inflammatory factors and indexes of oxidative stress before the operation and three months later. Results: There was no significant difference in operation time between the two groups. The amount of blood loss, the size of incision and bedtime in the study group were better than those in the control group (P<0.05). Compared with preoperative, the ODI and VAS scores of the two groups were both significantly decreased at the end of three months later, but the study group decreased more than the control group (P<0.05). There was no significant difference in serum inflammatory factors TNF-α and CRP or indexes of oxidative stress such as MDA, MPO, SOD and TAC between the two groups before operation (P>0.05), while the values of serum TNF-α and CRP in the study group significantly lower than those in the control group (P<0.05), the values of MDA, MPO in the study group significantly lower than those in the control group (P<0.05), and the values of SOD, TAC in the study group significantly higher than those in the control group at the end of three months later (P<0.05). Conclusion: It is well worth promoting and applying percutaneous transforaminal lumbar spine endoscopic discectomy in clinic for its’ advantages in less trauma, less blood loss and quicker postoperative recovery, which can improve the patients’ dysfunction, reduce the pain and values of serum inflammatory factors, improve the level of indexes of oxidative stress, and then improve the effect of surgery notably. Lumbar disc herniation is a common disease in orthopedics which often induces to osphyalgia and skelalgia . In recent years, the incidence of lumbar disc herniation was gradually increasing and affected people's physical and mental health seriously. Traditional open discectomy has been proved to be effective in clinical practice, but its application was limited on account of serious defects such as the large trauma to patients, potential destroys to stability of the spine, and major complications [2,3]. At present, the difficulties in the treatment of lumbar disc herniation are mainly focused on how to reduce surgical trauma, maintain integrity and stability of spine, and reduce the incidence of postoperative complications. With the rapid development of modern spinal surgery technology, percutaneous transforaminal lumbar spine endoscopic discectomy emerged at the moment, and has increasingly attracted people’s attention [4,5]. This surgical method belongs to minimally invasive therapy, with the advantages such as less blood loss, less trauma, fewer complications and faster postoperative recovery . However, it's still not long ago for the method to apply in clinic, and its clinical efficacy needs further investigation both in short-term and long-term as few related reports domestically. This study aimed to observe the effect of percutaneous transforaminal lumbar spine endoscopic discectomy in the treatment of lumbar disc herniation, and to explore its effect on indexes of oxidative stress, so as to provide valuable reference for the clinical treatment of lumbar disc herniation. A total of 110 patients with lumbar disc herniation from May 2015 to May 2016 in our hospital were enrolled. Inclusion criteria: conforming to the diagnostic criteria of lumbar disc herniation; imaging examination suggesting single segment lumbar disc herniation consistent with symptoms and signs; the symptoms not relieved after three months of conservative treatment; without contraindication for surgery. Exclusion criteria: accompanied with inflammatory changes of intervertebral disc; re-operation for recurrent lumbar disc herniation; with lumbar instability; combined with heart, lung, liver, kidney and other important organ diseases. The enrolled patients were divided into control group (n=50) and study group (n=60) according to different surgical programs. The control group consisted of 30 males and 20 females with average age of (53.67 ± 4.28 y) (from 20 to 65 y old) and an average course of (5.24 ± 1.74 y) (from one to nine years). The study group consisted of 40 males and 20 females with an average age of (2.54 ± 4.12 y) and an average course of (5.01 ± 2.32 y) (from two to eight years). There was no significant difference between the two groups in gender, age, course of disease and other general data (P>0.05). The patients in control group were given traditional open discectomy carried out as follows: cutting an incision (about 6 cm) at the center of the intervertebral space of the lesion, cutting open the supraspinal ligament and erector muscle in turn, stripping the erector muscle and exposing the affected vertebrae fully, fenestration with rongeur, removing the ligamentum flavum to expose and cut the dural sac, exposing the herniated intervertebral disc and removing the nucleus pulposus, placing drainage tube after operation. The patients in study group were given percutaneous transforaminal lumbar spine endoscopic discectomy carried out as follows: with patients in lateral decubitus position, applying percutaneous puncture of the intervertebral disc guided by Carm X-Ray machine after topical anesthesia, inserting a guiding needle from the ideal inserting point on the line of centers of the pedicles under positive perspective and on the line of posterior border of adjacent vertebral bodies under lateral perspective (Figures 1 to 3). Staining the nucleus pulposus tissue with methylene blue and performing discography (Figure 4), then grinding the facet joint and enlarging the intervertebral foramen with reamer gradually, placing working cannula in front of the spinal canal (Figure 5), infusing 3000 ml normal saline into spinal canal through intervertebral foramen, removing the nucleus pulposus which dissociative into the spinal canal, protruding out of the fibrous ring or stained (Figure 6), observing the rupture of annulus fibrosus in intervertebral disc, the dural sac and nerve root under microscope, cleaning the tissue fragments, stanching the bleeding, suturing and bandaging the skin incision in the end. Figure 1: Applying percutaneous puncture of the intervertebral disc guided by C-arm X-Ray machine. 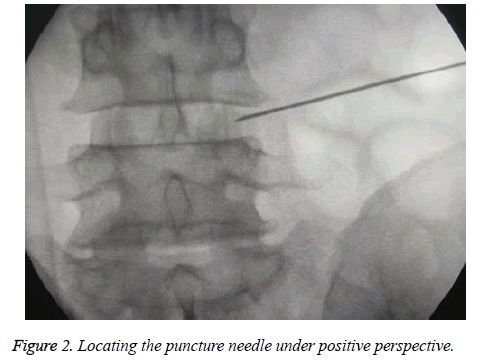 Figure 2: Locating the puncture needle under positive perspective. 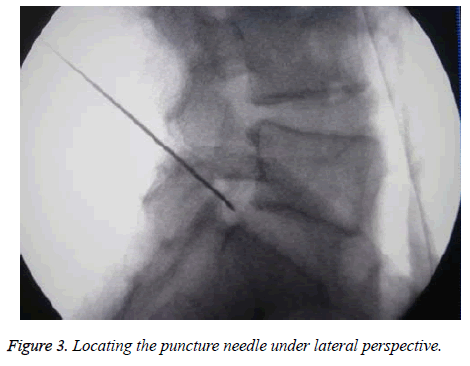 Figure 3: Locating the puncture needle under lateral perspective. Figure 4: The positive view of discography. Figure 5: Placing working cannula. 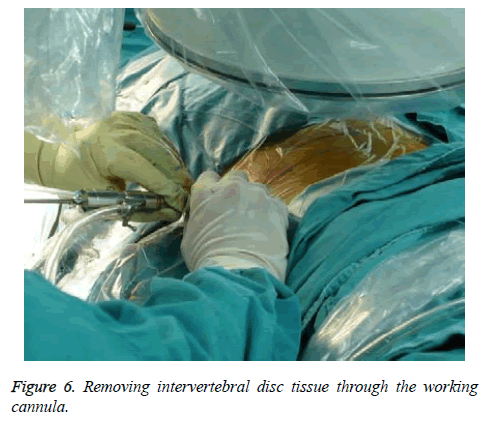 Figure 6: Removing intervertebral disc tissue through the working cannula. (1) Operation related indexes of the two groups were recorded and compared, including intraoperative blood loss, operation time, size of incision, postoperative bedtime, etc. .
(2) Degree of dysfunction before the operation and at the end of the three months after the operation of the two groups was measured by Oswestry Disability Index (ODI) which contains ten topics concerning social life, ability to stand, ability to walk, intensity of pain, ability to care for oneself, etc. . The scores for all questions answered are summed, then multiplied by two to obtain the index (range zero to 100). Zero is equated with no disability and 100 is the maximum disability possible. (3) Degree of pain before the operation and at the end of the three months after the operation of the two groups was measured by Visual Analogue Scale (VAS) , with the score of zero for no-pain, scores between one to three for mild pain, scores between four to six for moderate pain, and scores between seven to ten for severe pain. (4) The values of serum TNF-α (Tumor Necrosis Factor-α) and CRP (C Reactive Protein) were compared between the two groups before the operation and at the end of the three months after the operation. (5) The values of serum Malondialdehyde (MDA), Myeloperoxidase (MPO), Superoxide Dismutase (SOD) and Total Antioxidant Capacity (TAC) between the two groups before the operation and at the end of the three months after the operation were measured and compared. All statistical analyses were processed with SPSS 20.0 software package. Measurement data were expressed as (͞x ± s). The enumeration data and measurement data were compared with χ2 test and paired sample t-test respectively. A p-value of 5% or lower was considered to be statistically significant. There was no significant difference in the operation time between the two groups, but the intraoperative blood loss, the size of incision and the bedtime in the study group were better than those in the control group (P<0.05, Table 1). Table 1. Comparison of operation related indexes between the two groups (͞x ± s). Compared with preoperative, the ODI scores of the two groups were significantly decreased, but the reduction in the study group was greater than that of the control group (P<0.05, Table 2). Table 2. Comparison of ODI scores between the two groups (͞x ± s). Compared with the preoperative, the VAS scores of the two groups decreased after operation, but the decline in the study group was greater than that of the control group (P<0.05, Table 3). Table 3. Comparison of VAS scores between the two groups (͞x ± s). Before the operation, there was no significant difference in values of serum TNF-α and CRP between the two groups (P>0.05). After operation, the values of serum TNF-α and CRP in the study group were significantly lower than those in the control group (P<0.05, Table 4). Table 4. Comparison of changes of serum TNF-α and CRP (͞x ± s). Before the operation, there was no significant difference between the two groups of patients in serum MDA, MPO, SOD and TAC (P>0.05). After the operation, the values of serum MDA and MPO in the study group were significantly lower than those in the control group (P<0.05), while the values of SOD and TAC in the study group were significantly higher than those in the control group (P<0.05, Table 5). Table 5. Comparison of indexes of oxidative stress between the two groups (͞x ± s). Lumbar disc herniation is a common disease in orthopedics and usually treated with traditional open discectomy in the past, which apt to cause large trauma to patients and complications such as nerve root adhesion and lumbar instability etc. . In order to reduce the damage caused by surgery and reduce the incidence of postoperative complications, minimally invasive percutaneous transforaminal endoscopic spine surgery has been widely concerned by clinicians. The study analysed the effect of 110 patients with lumbar disc herniation treated with different surgical methods, and explored the validity and reliability of percutaneous transforaminal lumbar spine endoscopic discectomy. The results showed that the intraoperative blood loss, the size of incision and the bedtime in the study group were better than those in the control group, and compared with preoperative the ODI scores and VAS scores decreased significantly in both groups while decreased more in the study group, which was similar to Mroz’s finding. . It suggested that percutaneous transforaminal lumbar spine endoscopic discectomy can avoid unnecessary trauma, reduce blood loss and promote postoperative recovery, shorten the time of hospitalization and reduce economic burden to patients’ families . The reason may be that percutaneous transforaminal lumbar spine endoscopic discectomy applied in this study helped to reach the herniated intervertebral disc through the working cannula and remove the nucleus pulposus that protruded into the spine canal directly and definitely, and thus reduce the pressure of nerve roots [13-15]. The main advantages of this surgical method included avoiding the risk of anesthesia effectively under topical anesthesia to reduce the probability of damage to nerve roots;  protecting the ligament and muscle nearby due to leaving zygapophyseal joint and vertebral plate undamaged; with less disturb to spinal canal and the nerve structure and few scar tissue in spinal canal [17-19]; lighter postoperative pain due to the small incision. Besides, radiofrequency probe was used to help the damaged fiber ring to remodel and repair, and then reduce the amount of blood loss, reduce adhesion and scar to nerve roots, and reduce pain by denervating the intervertebral disc. And perfusion of normal saline during the operation will remove inflammatory mediators around the intervertebral disc and prevent accumulation of by-products, which can not only alleviate postoperative pain, but also reduce postoperative infection effectively [20-22]. TNF-α and CRP are common serum inflammatory factors, which can be used to evaluate the recovery of patients through the detection of concentrations . In this study, there was no significant difference in serum TNF-α and CRP values between the two groups before operation (P>0.05) while the values in the study group were significantly lower than those in the control group at the end of three months after operation (P<0.05). It suggested that percutaneous transforaminal lumbar spine endoscopic discectomy can effectively reduce the values of serum TNF-α and CRP, which may be the pathophysiological basis of this method in the treatment of lumbar disc herniation. It has been proved in relevant researches that the values of indexes of oxidative stress will change when body hurted, so recovery of the body can be evaluated through the changes of these indexes . This study showed that before the operation there was no significant difference in the values of serum MDA, MPO, SOD and TAC between the two groups (P>0.05); and after the operation, the values of serum MDA and MPO in the study group were significantly lower than those in the control group (P<0.05), while the values of SOD and TAC in the study group were significantly higher than those in the control group (P<0.05). It suggested that the indexes of oxidative stress were significantly improved in patients with lumbar disc herniation after treated with percutaneous transforaminal lumbar spine endoscopic discectomy. It should be noted that there were no reports on the complications and long-term recurrence of the two groups limited to the environment, the number of samples and clinical observation time, which should be supplemented by further investigation. In conclusion, it is well worth promoting and applying percutaneous transforaminal lumbar spine endoscopic discectomy in clinic for its’ advantages in less trauma, less blood loss and quicker postoperative recovery, which can improve the patient's dysfunction, reduce the pain and values of serum inflammatory factors, improve the level of indexes of oxidative stress, and then improve the effect of the surgery notably. Zheng C, Wu F, Lin C. Transforaminal percutaneous endoscopic discectomy in the treatment of far-lateral lumbar disc herniations in children. Int Orthop 2016; 40: 1099-1102. Karamouzian S, Ebrahimi-Nejad A, Shahsavarani S. Comparison of two methods of epidural steroid injection in the treatment of recurrent lumbar disc herniation. Asian Spine J 2014; 8: 646-652. Lin C, Yue Z, Tu G. A meta-analysis of endoscopic discectomy versus open discectomy for symptomatic lumbar disk herniation. Eur Spine J 2016; 25: 134-143. Jha SC, Tonogai I, Takata Y Percutaneous endoscopic lumbar discectomy for a huge herniated disc causing acute cauda equina syndrome: a case report. J Med Investig 2015; 62: 100-102. Hou T, Zhou Q, Dai F, Luo F, He Q, Zhang J. Repeated microendoscopic discectomy for recurrent lumbar disk herniation. Clinics 2015; 70: 120-125. Lohr M, Lebenheim L, Berg F, Gadolinium enhancement in newly diagnosed patients with lumbar disc herniations are associated with inflammatory peridiscal tissue reactions-evidence of fragment degradation? Clin Neurol Neurosurg 2014; 119: 28-34. Dalbayrak S, Yaman O, Yilmaz M, Ozer AF. Transforaminal approach in lumbar disc herniations: transforaminal microdiscectomy (TFMD) technique. Turk Neurosurg 2015; 25: 29-35. Li X, Dou Q, Hu S. Treatment of cauda equina syndrome caused by lumbar disc herniation with percutaneous endoscopic lumbar discectomy. Acta Neurologica Belgica 2016; 116: 1-6. Kogias E, Franco JP, Klingler JH, Hubbe U. Minimally invasive redo discectomy for recurrent lumbar disc herniations. J Clin Neurosci 2015; 22: 1382-1386. Gotecha S, Ranade D, Patil SV, Chugh A, Kotecha M, Sharma S. The role of transforaminal percutaneous endoscopic discectomy in lumbar disc herniations. J Cranioverteb Junct Spine 2016; 7: 217. Mroz TE, Lubelski D, Williams SK, Orourke C, Obuchowski NA, Wang JC. Differences in the surgical treatment of recurrent lumbar disc herniation among spine surgeons in the united states. Spine J Off Je N Am Spine Soc 2014; 14: 2334-2343. Elsaied HE, Hamdy MD, Elsherbini AI, Mohsen IA. Investigation of proniosomes gel as a promising carrier for transdermal delivery of glimepiride. Univ J Pharm Res 2016; 1: 1-18. Jang JS, An SH, Lee SH. Transforaminal percutaneous endoscopic discectomy in the treatment of foraminal and extraforaminal lumbar disc herniations. J Spinal Disord Tech 2006; 19: 338-343. Kamper SJ, Ostelo RW, Rubinstein SM, Nellensteijn JM, Peul WC, Arts MP. Minimally invasive surgery for lumbar disc herniation: a systematic review and meta-analysis. Eur Spine J 2014; 23: 1-23. Kerr D, Zhao W, Lurie JD. What are long-term predictors of outcomes for lumbar disc herniation? A randomized and observational study. Clin Orthop Relat Res 2015; 473: 1920-1930. Kaijian H, Chuanjian L, Chao C, Bangtai W, Dan Z, Weijie Z, Xuhuang W, Xi X, Qiuming C. Association of probiotics and bone mineral density in Chinese patients with type 2 diabetes. Biomed Res 2017; 28: 129-133. Li X, Dou Q, Hu S, Liu J, Kong Q, Zeng J. Treatment of cauda equina syndrome caused by lumbar disc herniation with percutaneous endoscopic lumbar discectomy. Acta Neurologica Belgica 2016; 116: 1-6. Golinvaux NS, Bohl DD, Basques BA, Yacob A, Grauer JN. Comparison of the lumbar disc herniation patients randomized in sport to 6,846 discectomy patients from nsqip: demographics, perioperative variables, and complications correlate well. Spine Off J N Am Spine Soc 2015; 15: 685-691. Yoshimoto M, Iwase T, Takebayashi T, Ida K, Yamashita T. Microendoscopic discectomy for far lateral lumbar disk herniation: less surgical invasiveness and minimum 2-year follow-up results. J Spinal Disord Tech 2014; 27: 1-7. Yamashita K, Higashino K, Sakai T, Takata Y, Abe M, Morimoto M. Revision percutaneous endoscopic lumbar discectomy under the local anesthesia for the recurrent lumbar herniated nucleus pulposus in a high class athlete: a case report. J Med Investig 2016; 63: 135-139. Felix SY, Yunus AA, Dingwoke FJ, Udokwu JC. Abacavir loaded nanoparticles: preparation, physicochemical characterization and in vitro evaluation. Univ J Pharm Res 2016; 1: 19-24. 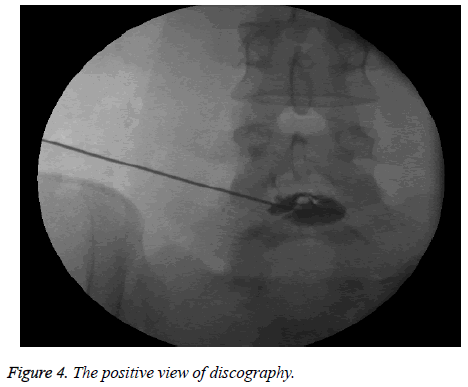 Kapetanakis S, Giovannopoulou E, Charitoudis G, Kazakos K. Transforaminal percutaneous endoscopic discectomy for lumbar disc herniation in Parkinsons disease: a case-control study. Asian Spine J 2016; 10: 671. Stromqvist F, Stromqvist B, Bo J, Karlsson MK. Gender differences in patients scheduled for lumbar disc herniation surgery: a national register study including 15,631 operations. Eur Spine J 2016; 25: 162-167. Motor S, Ozturk S, Ozcan O, Gurpinar AB, Can Y, Yuksel R. Evaluation of total antioxidant status, total oxidant status and oxidative stress index in patients with alopecia areata. Int J Clin Exp Med 2014; 7: 1089-1093.